A new subspecies of the Similar Dog-Day Cicada has been described in the paper A new Neotibicen cicada subspecies (Hemiptera: Cicadidae) from the southeastern USA forms hybrid zones with a widespread relative despite a divergent male calling song by David C. Marshall and Kathy B. R. Hill (Zootaxa, Vol 4272, No 4). The cicada is named Neotibicen similaris apalachicola. 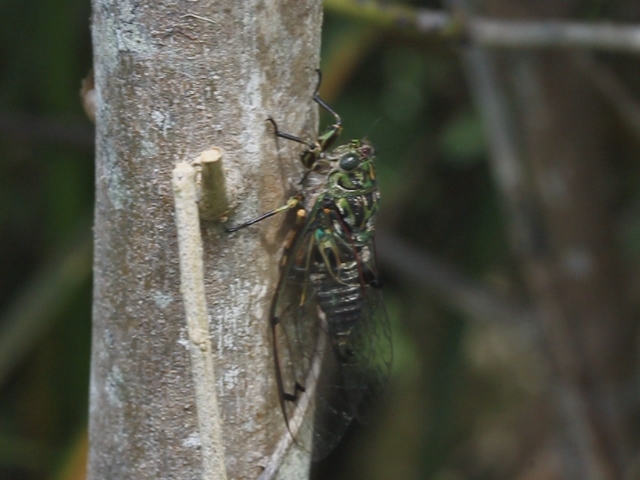 This cicada lives in Florida, Georgia & Alabama, and hybridizes with the other Similar Dog-Day Cicada sub-speces, Neotibicen similaris similaris. The document is available on biotaxa.org. You will find song samples and maps on the Insect Singers website. If you’re interested in North American cicada species, and you’re looking for sound files of those cicada’s songs, check out Insect Singers, a new website from cicada researchers David Marshall and Kathy Hill. It has dozens of audio samples. Awesome! David Marshall and Kathy Hill have discovered that a particular species of katydid mimics the wing-flick of female cicadas to lure male cicadas to their certain doom. Read the entire research article: Versatile Aggressive Mimicry of Cicadas by an Australian Predatory Katydid.